This guide is intended for publishers looking to add support for banner and interstitial custom events within Ad Manager mediation. In the following example, you first create a banner custom event within Ad Manager mediation. This requires that you define a custom event that points to that specific class in your application through the Ad Manager UI, then implement a banner custom event to return a view. 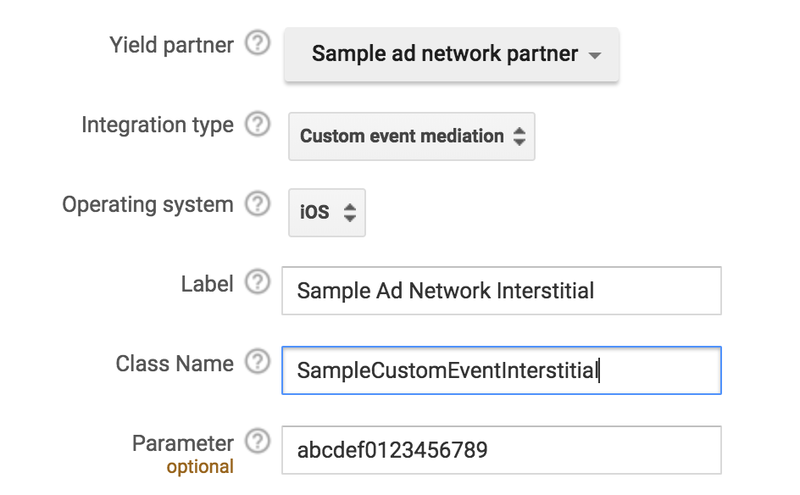 Custom events must be defined in the Google Ad Manager UI. You can find instructions for setting up an Ad Manager yield group for mediation in this Help Center article. 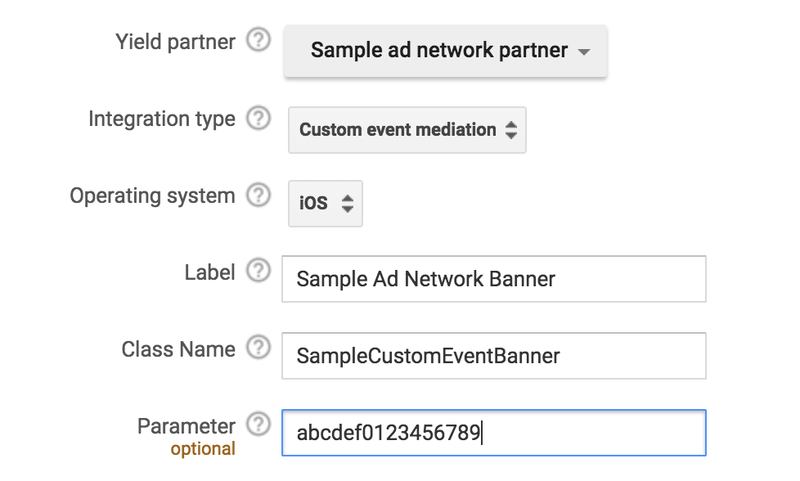 If your SDK does not support the given ad size or does not support banner ads, call the customEventBanner:didFailAd: method of the custom event delegate. The serverParameter and serverLabel parameters correspond to the parameter and label fields defined when creating a custom event in the Ad Manager UI. Note: Your custom event must notify Ad Manager mediation via the custom event's delegate when it receives or fails to receive an ad. Otherwise, the custom event times out, and mediation moves on to the next network. In order to send ad network extras with the request for your custom event to handle, you use the GADRequest registerAdNetworkExtras: function. You must create an instance of GADCustomEventExtras (which conforms to the GADAdNetworkExtras protocol) in order for a GADCustomEventRequest.additionalParameters property to be populated. To pass in your extras, call GADCustomEventExtras setExtras:forLabel:, passing in your extras as a dictionary and the label of your custom event that you defined in the Ad Manager UI. Custom events must be defined in the Ad Manager UI. You can find instructions for setting up an Ad Manager yield group for mediation in this Help Center article. Your custom event should act as a delegate to your SDK to listen to callbacks. The serverParameter and serverLabel parameters correspond to the parameter and label fields defined when creating a custom event in the Ad Manager UI.